The basic starting point is that of two cylinders (aka twin set, doubles), which are manifolded via an isolator manifold. The isolator is key in that it allows access to all the gas at any time including after a regulator / hose / O ring failure. Stainless steel bands are then used to hold the cylinders together and also to mount them to the backplate via 8mm bolts. We use Faber lightweights - these are 232 bar cylinders with a 25mm neck thread - the Faber's have good buoyancy characteristics and are compact in shape/size. 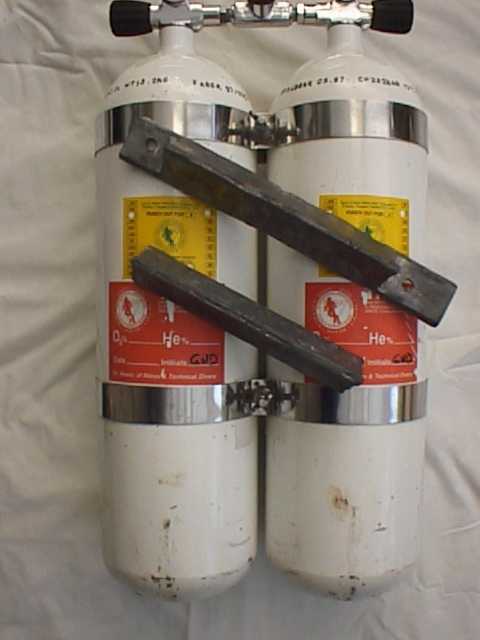 The cylinder capacity is dependent upon the dive in question, we use either twin 10l's or twin 12l's dependent upon gas requirements for the dive (a set of 12l's are shown in these photographs). The cylinders are left as clean as possible - they use steel bands to hold them together and don't have cylinder nets or boots fitted at all. Boots are not fitted as they are not required. The main reason for boots is to stand a cylinder up, at scuba lesson one - o - one you are told never stand a cylinder up - so go figure. One down side I have seen to boots is that they hide potential corrosion and as are usually only removed at test , this is usually too late to fix and the cylinder fails. Nets are not fitted as they can tear and then snare on a piece of wreck / cave and become an entrapment point - they also ruin the streamlining of the cylinder itself. 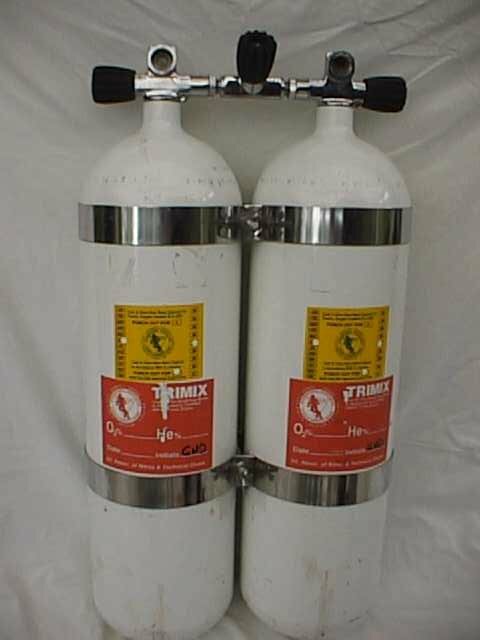 As for stickers and such - aim for the absolute minimum - for gas diving you will have to have a VIP and content sticker on the cylinder - we mount these on the cylinder such that they are under the backplate when its all together. Why no stickers ? Think about the photo opportunities - the viewer wants to see the environment, the diver, the wreck or the cave etc not the fact he bought the cylinders at XYZ dive shop and that "Divers do it ...."
Some divers see pictures of D rings mounted on the bottom of the cylinders and then used for hanging torches and reels etc. These in reality are mounted in a terrible place. The D rings are an entrapment point for any line or monofiliment that the diver brushes against. Any torches hanging from these D rings are free to swing about and bang / clang around - this stresses and shakes the bulb filaments. These torches are your backup and emergency lights, you don't want to go to find one and then find out that it broke on the walk down from the car park. The cylinders are manifolded with an isolator manifold, the advantage of a manifold is that it is the easiest way of managing your gas supply. The only exception being solo and side mount diving, where complete independents make more sense. Diving with independent cylinders requires great care and superior gas management capabilities to effectively monitor the total gas supply, which experience has shown many people are not capable of. 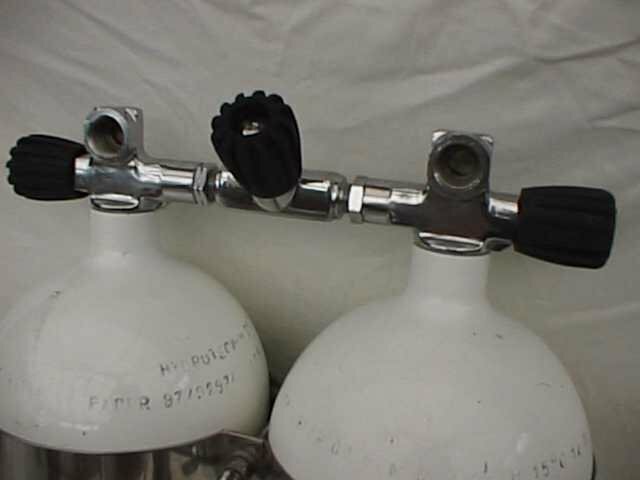 Isolated manifolds allow the diver the option of isolating the cylinders,in the event of a neck ring blowing on a cylinder - all other failures (first stages, hoses blowing) being protected from by turning off the valve in question. They do NOT give the diver the option of closing the centre and diving with different mixes in the two cylinders, this being an extremely dangerous practice. They are another valve and set of O rings, which are just as likely to fail as the ones on your cylinders - as such its important to look at the construction of the manifold to ensure the absolute best design is used. Be aware that redundancy which cannot be used is not redundancy, therefore you must always be able to reach all the knobs on the manifold and turn them off by yourself during the dive if required. If we have a hose blow or free flow, we first turn off the centre knob (immediately protecting one cylinder contents) then work out which first stage is associated with the failure and then turn that knob off, we can then turn back on the centre isolator to allow access to all our remaining gas. 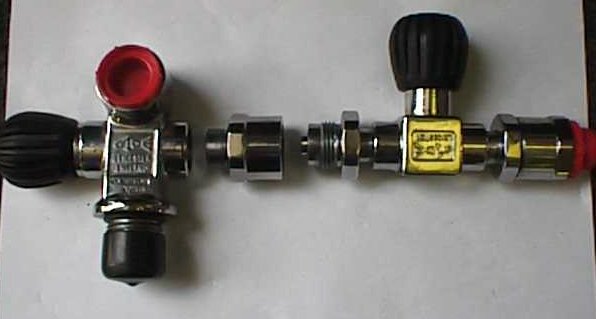 The manifold needs to use barrel O rings, as shown in the photograph to the left, for the centre section - these are of a superior design over the face type O ring manifolds, shown to the right, that are also available. 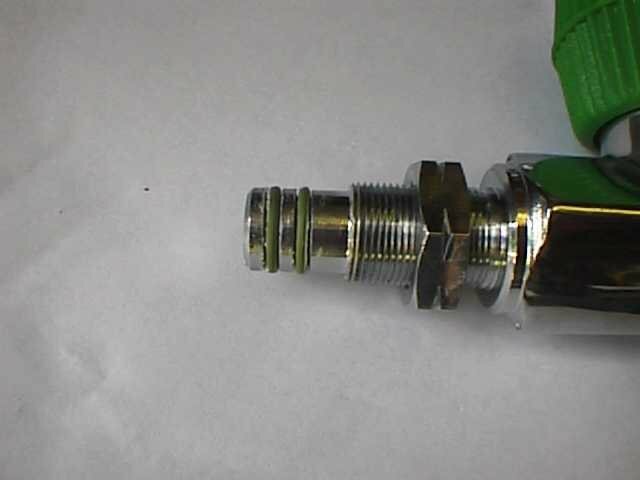 That is not to say that the face type manifolds are not safe they are just not as good as the barrel ones, the reason being is that the barrelled centre section is able to move in the event of it becoming loose without it twisting and possibly extruding the O ring thus causing a gas leak. We have found two manifolds that are of this construction in the UK - the Scubapro (click the links for detailed photographs) and the "Italian Manifold aka the IANTD manifold" - They are both available from Runnymede Dive. 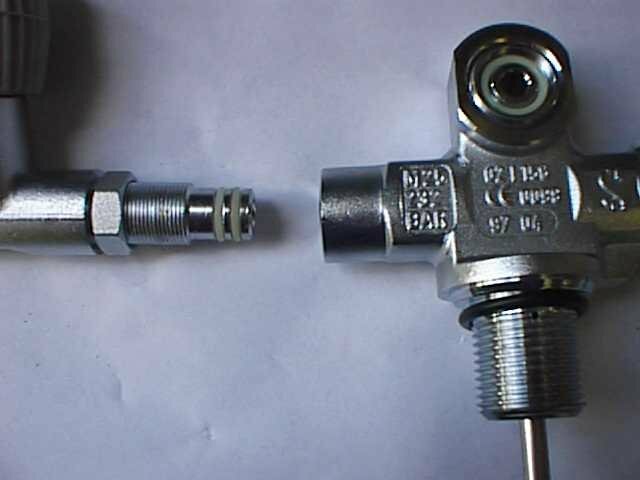 Unfortunately both are only available in 25mm neck threads - so if you have 3/4 BSP you are going to have to use the MDE manifold. We all see it done in dive shops or at sites, its not a good practice as it does stress the manifold. 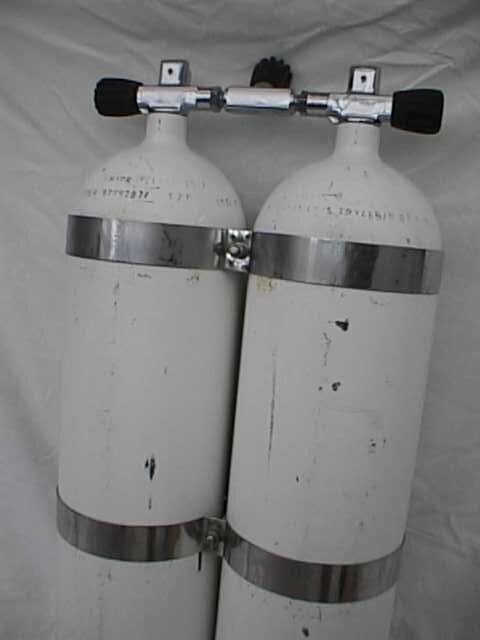 If you see it being done in a dive shop with your twin set, politely ask the gas blender to stop doing it. Suggest that they carry the twin set by the two valves or with one hand on a valve and the other on the bottom of the same cylinder so that it is carried across the chest. If we see a novice not doing a skill correctly we educate them and correct it, same here, carrying twin sets by the manifold is an educational opportunity for us all, the gas blender may just not realise that what he is doing is wrong. Yes, I'm not pulling your leg here, the manifold and valve knobs can take a thump if your not too careful. 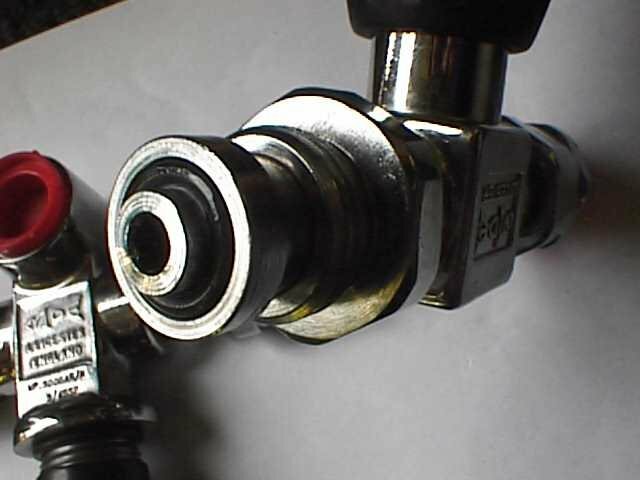 Some people try and protect them with valve guards etc - these are terrible entrapment things that prevent you from gaining quick and easy access to your manifold knobs in the event of having to do a gas shutdown - therefore they are not a good idea. Consider that if you are banging into the roof of a cave or a wreck all the time maybe it's your technique which needs modifying. Surely the best thing is not to protect the valves it is to not hit them in the first place (bit like the bull bar debate of 4WD vehicles). However there are times when you may hit the roof of the overhead environment, you don't want to shatter the valve knob which in the UK cold waters and with the standard hard plastic knobs we often get is a strong possibility. Sherwood make a hard rubber knob which is excellent. They are nice and chunky to get hold of so help in shutting down in emergency drills. They only seem to fit the Scubapro and the Italian manifold - They are available from Runnymede Dive to special order. If you find another style knob check out the metal plate inside the knob - this plate goes over the valve stem, if it rips out of the knob easily, you will not be able to turn the knob off, also if its a thin metal plate it could strip the corners off and then simply rotate around the valve stem - again preventing you from turning the valve off. 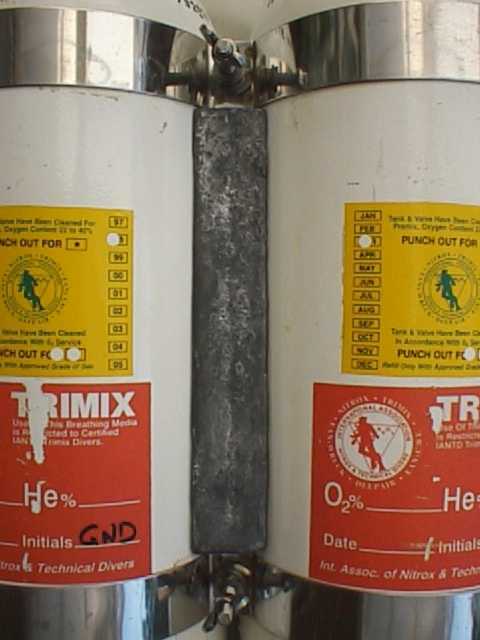 If you are nitrox or trimix diving you don't want to consider 300bar cylinders. The gas laws become very non linear above about 220 bar as such gas mixing becomes more of a lottery at 300bar. Also a 300 bar cylinder, due to gas laws, only contains the same free gas volume as if it was pumped to 270 barand the gas law where linear. Lastly the 300bar pressure causes undue stress on the manifold, the HP hoses and your regulators themselves. DIN is pretty much accepted by most people as being the more secure system - the O ring is captured and is less likely to extrude than with an A clamp system, which would lead to a gas leak. Not many people realise that A clamp was designed to be used to 3000 PSI which is only 207 bar. The 232 bar A clamps you see have just had more metal added to the yoke section. Copyright © 2001 [Gas - Diving]. All rights reserved.